From mid-September through early October of 1996, volunteers from MAHS joined reseachers from East Carolina University to survey a historical wreck site for Submergerd Cultural Resources Committee of the government of Anguilla, in the British West Indies. The project consisted of the visual survey of a remote area off one end of the island. Documentary evidence suggested that the area may have been the wreck site of an 18th-century Spanish warship, El Buen Consejo, capistana for the 1772 flota from Cadiz. 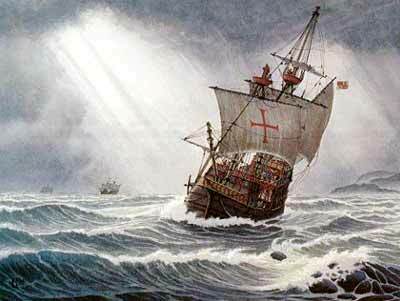 Each year beginning in the 16th century, Spain sent a fleet of ships known as the flota to its colonies in the New World. Controlled by Seville merchants, the flota carried trade goods from Europe and returned with precious metals for the Crown. The fleet was at first composed only of commercial vessels, but losses from pirating eventually led to the need for military escorts. El Buen Consejo was a warship of 70 guns drafted at the last minute for the 1772 flota from Cadiz to Veracruz, in part as a cargo vessel when merchants realized they had too much cargo for the existing fleet.